As promised a post of my grandma's birthday celebration special dish. It came out later than I expected due to preparation of ICSS final, which was held yesterday and I will definitely write about it after my final exam. Okay, now to the special dish. It was a very special Chinese dish that is said to be originated from a legend story - Beggar's chicken! As per the name, the origin of this dish came from a story where a beggar. Somehow, he got his hand on a chicken and probably due to his poor circumstances, he had to be creative and decided to cook the chicken with the mud. 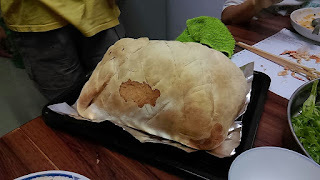 As the chicken was cooked, a crust formed over it and thus a new way of cooking chicken appear. This is the story I heard from my grandma and aunt. The other versions of story can be found in Wikipedia. ICSS (round 3) and updates! Hello, everyone!! Sorry for disappearing for one whole week. I was really busy that I had no time to give any updates. So let's start from 13th of November. It's round 3 of the competition!!! We were told to gather in Pavilion at 9.30am. To our dismay, Pavilion opens at 10am and we had to go through quite a trouble to find our way in since a lot of places were blocked and guarded strictly. Thus, the meeting place was changed to the main gate of Pavilion. 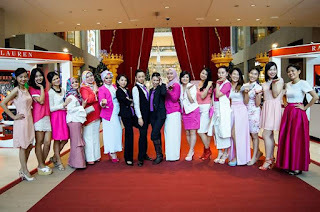 Anyway, our competition ground wasn't in Pavilion, but in Benefit in Starhill Gallery. Before we proceeded to our competition, a mandatory picture before the start of the day. Last week Sunday, was the second round of competition and it was held in Mid Valley. The reason we were there was because one of our sponsors - Metrojaya is in there. For this round of competition, we arrived in Mid Valley at 9.30 am and gathered right in front of Guess. Though they told us that the competition started at 9.30am, it started an hour later (can never get used to Malaysian timing). What we did on the spare time? Lots of talking and pictures. Here's some of them. When everyone was gathered, there was a short briefing on where's the venue and how we should walk there. And lots of taking pictures again. These process took another 30 minutes, I supposed. During these process, we attracted quite a lot of attention, probably due to our all black and white attire. Hey everyone!!! This is last week's updates. Mostly food though, as I don't think you are interested in my boring life. I went back to Hanatama Japanese Restaurant again. This time for lunch. If you haven't seen my previous post regarding this restaurant, click on this link. Usually, I won't have lunch alone. 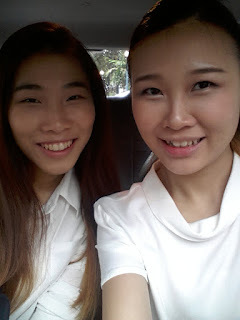 But this time, I went back there as I had to do my AIESEC job (meeting with the boss there for selling my project). As I did not want to waste time thinking for what food to get, I might as well eat in the restaurant as I still have a lot food I want to try. 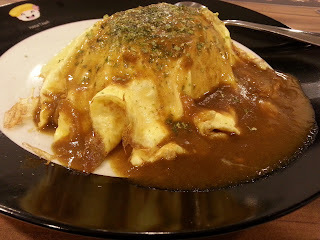 I had always wanted to try japanese curry omurice which was why I ordered it. Surprisingly, the curry omurice tastes amazing!! I, who previously dislike Japanese curry as I find the taste weird and fake, find this tasty, maybe because it is cooked by a chef. Hiii!! I was really busy last week, so didn't really get to update. As I have told you in one of the previous posts, I have joined a competition, in which BrandImage International Consultant is in search of an Image Consultant. The competition is spread over 5 consecutive Sundays. And last Sunday was the first. The competition is held at Hotel Capri by fraser from 9.30am to 4.00pm. There were a series of speech and introduction. During one of the introduction games (bingo game), I successfully won a gift - a 'Chance' in the next round of competition. It allows me to request for something other participants do not have, which I think is a benefit for me since most of the participants are professional in beauty industry. After the lunch, which is sponsored by Capri Hotel, the competition started at 2.00pm. The competition theme was High Powered Political Lady and the tagline was "Captivate, Command and Conquer".